Qamishli, Syria: There was nothing about the hungry, bedraggled man who surrendered at a remote desert checkpoint belonging to the United States’ Kurdish allies this year to suggest he had once played a part in one of the biggest events in American history. He was limping from injuries to both knees, his beard was matted and teeming with lice, and he was fleeing from Daesh. After he identified himself and checks were run, the confirmation came back. This was Mohammad Haidar Zammar, the man who recruited the hijackers who carried out the attacks on September 11, 2001, killing over 2,900 people and propelling the United States into unending conflict. In his first interview with a US news organisation since 2001, conducted in the presence of the Kurdish guards who are holding him at a prison on the outskirts of the Syrian city of Qamishli, Zammar recounted his extraordinary journey. It was one that took him from the earliest days of the Al Qaida camps in Afghanistan to the battlefields of Daesh in Syria, via a rendition suspected to have been ordered by the CIA. Now aged 57, Zammar holds dual Syrian and German citizenship. Zammar’s family moved to Germany when he was 10, and he first tried to participate in armed conflict in 1982, far earlier than has previously been reported. He travelled to Jordan in an attempt to enter Syria to join the armed wing of the Muslim Brotherhood, the Fighting Vanguard, which was engaged in an earlier uprising against the ruling Al Assad family. He was turned back by the Jordanian authorities, but on the trip he met a man who would play a big role in his future: Mohammed Al Bahaiya, known as Abu Khaled Al Suri, who would later become a key figure in the current Syrian war. 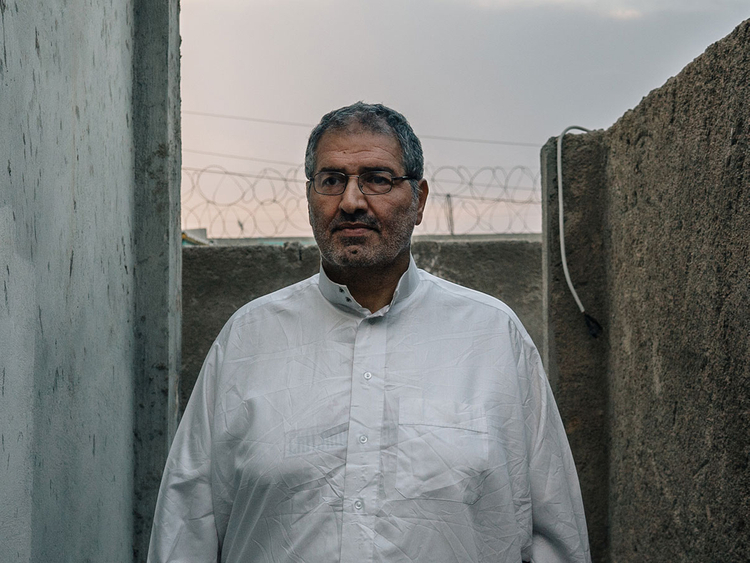 At Al Bahaiya’s invitation, he made his first visit to Afghanistan in 1991, to receive military training at one of the militant camps being run by Al Bahaiya. Over the next decade, Zammar moved through the militant circuit, travelling regularly to Afghanistan, volunteering for a stint with Al Qaida-affiliated militants in the war in Bosnia and visiting London, where he befriended the Jordanian Palestinian preacher Abu Qatada, a prominent figure long suspected by the United States of having links to Al Qaida. Meanwhile, Zammar was developing a circle of followers at Hamburg’s Al Quds mosque, which had become a magnet for young Muslims in the city. Zammar held regular gatherings with small groups of the men who went there to pray, seeking to convince them that they had a duty to wage “holy war” on behalf of Muslims worldwide and to travel to Afghanistan for military training. Zammar’s travels and contacts stirred the suspicions of the German authorities, who alerted the CIA and began monitoring his movements and telephone calls. But he continued to travel widely. Towards the end of 1999, Zammar made another visit to Afghanistan, overlapping with 9/11 ring leader Mohammad Atta and other members of the Hamburg cell making their first visit to the country - and carrying with them their proposal to crash planes into American buildings, according to investigators. Zammar continues to deny any foreknowledge of the 9/11 plot. “God knows, and in all honesty, I did not know anything about the 9/11 strike. They did not tell me anything,” he said. That was the conclusion reached at the time by German authorities, according to Guido Steinberg, who investigated Zammar’s involvement in the attacks on behalf of the German government and is now a senior associate at the German Institute for International and Security Affairs. The German investigation found that the members of the Hamburg cell had been suspicious of Zammar, in part because he was “very chatty,” Steinberg said. US investigators never reached a firm conclusion about Zammar’s potential involvement but also suspect that he may have proved too talkative to be trusted with knowledge of the 9/11 plan, according to Ali Soufan, a former FBI agent who now runs the Soufan Center, which focuses on counterterrorism. Three months after the attacks, he dropped out of sight. While on a visit to Morocco, he was arrested by Moroccan police and deported to Syria. The CIA was reported at the time to have played a part in his seizure and transfer, but Zammar says he does not recall meeting Americans during the process. For the next 12 years, he was held in Syria’s notorious Sednaya prison outside Damascus, where he says he was tortured and kept in solitary confinement for months on end. In 2013, he was freed along with six other Islamists in a prisoner swap for Syrian regime army officers negotiated by his old friend Al Bahaiya. Once released, Zammar chose to join the newly formed Daesh. Now he languishes in another prison cell, alongside about 30 other Daesh prisoners being held by the Kurds. The Kurds say they would like to be rid of him and all Daesh captives they hold. Zammar says he would like to return to Germany, to reunite with his first wife, whom he said he hasn’t seen since 2001. But the German government has shown no interest in repatriating him or any of the other Germans who set out to fight for the Daesh and are now in Kurdish custody.